I am fascinated by the powerful memories that can be triggered by a specific scent, but my love of perfume was triggered by the realization that the formulation for a favorite perfume of mine had changed without warning. Back in the early '90s, the perfumes I recall being all the rage were Obsession, Liz Claiborne and Colors de Benetton. My favorite was Colors de Benetton in the clear bottle. Several years after I graduated high school, the big bottle I had to save up to buy had sprayed its last spritz. I made the quick trip to the local Benetton store at the Florida Mall and bought a replacement. It didn't occur to me to try it out in the store, it was a simple refill purchase. The replacement bottle wasn't clear like the empty one I had at home, now it was a dark green. No matter, I thought - still the same name, price etc. WRONG. The green bottle smelled to me like it was a close cousin of Pine Sol. I thought there had to be something wrong with the bottle from the Benetton store, so I purchased one from Perfume.com, thinking I might get a bottle from a different batch (?). Nope. I sent the Pine Sol concoction back to Perfume.com and took the foul smelling stuff back to Benetton. I scoured the web for some information about why the perfume I loved no longer smelled like it did originally. I came up empty handed. 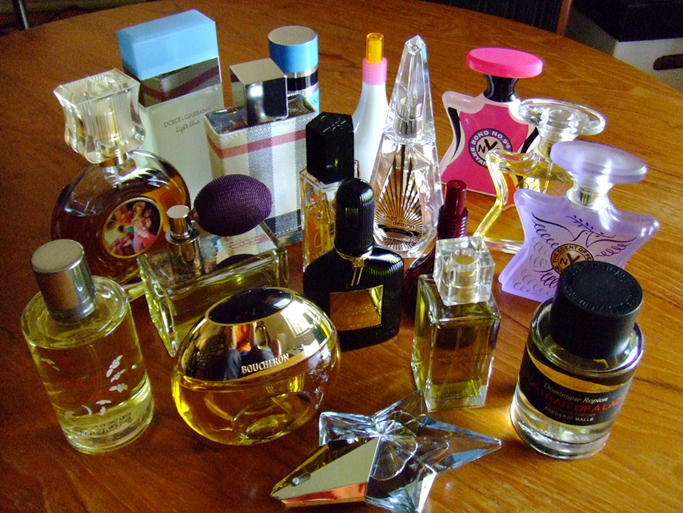 Luckily, you can still find people selling unused (or partial used) bottles of perfume on eBay. While I was on the quest for confirmation that Benetton had changed the formulation, I stumbled across Basenotes.net I was completely unaware that there was a community of people sharing opinions/information on perfumes that had gone out of production, were new to the market or had quietly changed their formulation. Around that time, I was also reading Jitterbug Perfume by Tom Robbins. The undercurrent of the plot is scent and one of the main character's desire to recreate a 300 year old perfume from a bottle in her possession. I began to dig deeper into the world of perfume after seeing the movie Perfume: The Story of a Murderer (I read the book afterwards, and naturally it was better.). I then found Luca Turin through continued research, and read his book with Tania Sanchez - Perfumes the A-Z Guide, The Secret of Scent (Luca Turin), Emperor of Scent: A True Story of Perfume and Obsession (Chandler Burr). As I was reading all these books, I researched how I could get my hands on the perfumes Luca Turin writes about. That's how I came across The Perfumed Court and the ladies at Sniffapalooza. Surrender to Chance is another group of women who sell perfume decants, so if TPC doesn't have what you're looking for, check over at SC. Eventually I got interested enough to take part in two Sniffapalooza scent themed travel tours! The first one was to Barcelona, Spain and the second was to Lisbon, Portugal. Each trip was a unique excursion into Europe via one's nose! I found my favorite perfume (hands down!) via Katie Puckrick's vlogged perfume reviews. Frederic Malle's Portrait of a Lady (Perfumer: Dominique Ropion) is the most fantastic perfume I've ever smelled. Katie's review of PoaL was so compelling, I purchased a sample from TPC, wore every last drop of it and just had to purchase a full bottle! At the time, it was quite difficult to buy from FM's online shop. I had to call my credit union, explain that I was attempting to purchase a perfume from an online shop in France - and could they please allow the transaction to complete? Once they'd opened some ports in the credit union firewall, my purchase was complete and I was ecstatic to have a full bottle of PoaL winging its way to me! Fun fact: Marie Antoinette was caught trying to escape from the French Revolutionaries disguised as a peasant, but was recognized as royalty because she smelled fantastically of Houbigant, which no peasant could ever afford to wear. This is but a small portion of my collection. I have hunted down dozens of different perfume decants after coming across a reference to a perfume critical to a character's reaction in a film (Arpege via "A Single Man", or many of those mentioned in a book (The Perfume Collector). My nose is always curious and learning. Aruba showed off their 802.11ac outdoor access point in an off-camera, 'don't talk about it til you can talk about it' session at the last WFD6. Now that the cat is out of the bag, the 274 and 275 can be discussed freely. We were shown a prototype of the 275 model access point and the single piece of metal bracket especially designed for the AP 275. Christian Gilby wrote a good post on the new access point and published it to the Airheads community. In the post he also covers recommended distances between outdoor mesh access points as well as links to antenna options for the new access point. The list price for the AP 275 is $1995 for the dual radio 3x3:3 access point. The access point can be controller based or controller-less. The power requirements for the access point is 802.3at or standard AC power. Inside the access point housing is two horizontal and one vertically polarized antenna. This access point has been designed to have advanced cellular coexistence, meaning it is good at out of band filtering in order to avoid the LTE frequencies which have side lobes which affect the 2.4GHz spectrum. The access point was surprisingly lightweight given the size of the AP 275. I liked the single piece of metal mounting bracket and that the access point weights less than six pounds (~2.5 kg). The single type of installation bracket and the minimal weight of the unit will allow outdoor installations to be streamlined and simplified. This single mounting bracket however does not allow strand mounting (a popular mounting style for Cisco and Ruckus outdoor access points). This may or may not be an issue for Aruba mesh customers. I've heard all about the different types of wireless attacks that can be launched against any wireless environment. Firesheep was one of the first wireless attacks I could see being launched on the wifi network of any restaurant, coffee shop or waiting room. Of course there are thousands of possible wireless attacks, but I'm dubious about the actual use of wireless attacks outside of a white/black hat conference, or attacks being launched at individuals instead of being launched at a corporation. It seems to me that miscreants would be more likely to try out Wi-Fi attack tools at a University, coffee shops or an IT conference where their cracking attempts would most likely go unnoticed. The flip side to a newbie hacker trying out their tools is an individual/team working to obtain credit card information or other digital information that is of some financial value. These attacks would be in the same vein as that against T.J. Maxx back in 2005. This all leads me to what I witnessed for the first time at AirTight when I sat down, opened my laptop and began to settle in for their WFD6 presentation. Coffee in hand, I looked around for the Wi-Fi PSK or credentials for their guest Wi-Fi. I noticed that my laptop showed it was already connected to a WLAN, but I thought it unlikely that the SSID from the last WFD was still in use, and that my credentials were still cached on my laptop. I clicked on the Wi-Fi connectivity icon and it showed that I was connected to the McCarran WiFi SSID. Say what? That's not even possible. That's the free Wi-Fi SSID from the airport in Las Vegas! As the list of available Wi-Fi networks available began to populate on my screen, there was no way that all these SSIDs were really available. I was seeing a list of every SSID I'd ever connected to and hadn't pruned from my list of known networks. Turns out, what I was seeing was a Wi-Fi Pineapple running Karma. Basically what I was seeing was my laptop beaconing the request to connect to any of its known networks and the Pineapple responding back with "YES!" I immediately began pruning my list of known networks on my laptop, but I don't have the option to remove known networks from my iPhone once that known network is out of range. I could always take the extreme measure of resetting all my Network Settings in my phone, but I wasn't ready to make that leap. The Karma demonstration was a lead in for the "AirTight Magic Show" with Sean Blanton. The feature that AirTight has to combat a Pineapple/Karma attack is that the AirTight system can detect known enterprise user devices and make it so that once you connect to the secured corporate WLAN you’re actively blocked via de-auth packets from connecting to any other WLANs while you're in the workplace. With AirTight, it is possible to block the ability of known enterprise clients to join their own Mi-Fi devices or personal SSIDs. I've not seen this type of functionality present in any other vendors' wireless capabilities. I was impressed not only by the Karma demo, but the ability of AirTight to keep enterprise devices associated to enterprise WLANs and prevent them from associating to 'unauthorized' WLANs.